RAMALLAH, (PIC)– The Muslim Youth Association has announced several events that will take place in cities across the West Bank to mark the 44th anniversary of the occupation of Al-Aqsa Mosque, East Jerusalem, and Palestine as a whole. 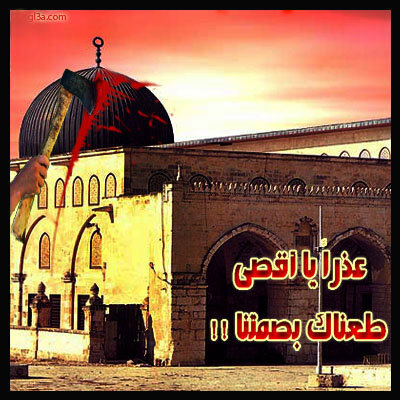 ”In memory of the occupation of Jerusalem, Al-Aqsa Mosque, and the West Bank, we call for determination to liberate the land and the people, and to rise up against the force of tyranny,” the MYA added. The group also called for the need to escalate confrontation with occupation forces and to address them with “all strength and determination”. The events include marches that will take place in nearly every major city in the West Bank on Friday June 3 to renew commitment to the liberation of the Aqsa Mosque. On Sunday June 5, “stands of anger” and a general commercial strike will be staged at 11:00am, when marches will be launched in city squares in Al-Khalil, Nablus, and Ramallah. Tuesday will include a comprehensive escalation against Israeli forces and settlers in areas of friction near Israeli checkpoints in and around Jerusalem as well as those in Kalandia, Hawara, Rachel’s Tomb, Bil’in, Ni’lin, and the bypass roads and outposts in Al-Khalil. In the soft golden light of a late spring evening, as yellow flowers are beginning to bloom on giant cacti, Yacoub Odeh climbs up through knee-high grass to the ruin that was his childhood home. For a man in his eighth decade, he is surprisingly nimble as he navigates ancient stones that litter the ground. But behind his light step is the weight of painful memories of a lost youth and a fading history. With distant eyes, he describes an idyllic childhood in a place he calls paradise, where families helped one another and children played freely amid almond and fig trees and on the rocks around the village’s natural spring. The place is Lifta, an Arab village on the north-western fringes of Jerusalem, for centuries a prosperous, bustling community built around agriculture, traditional embroidery, trade and mutual support. But since 1948, shortly before the state of Israel was declared, it has been deserted. The population, according to the Palestinian narrative of that momentous year, was expelled by advancing Jewish soldiers; the people abandoned their homes, say the Israeli history books. 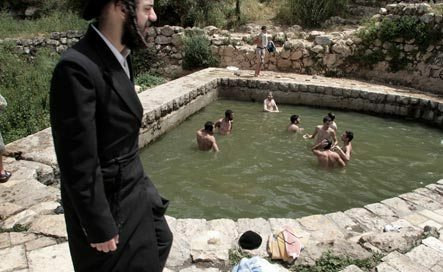 Lifta was one of hundreds of Arab villages taken over by the embryonic Jewish state. But it is the only one not to have been subsequently covered in the concrete and tarmac of Israeli towns and roads, or planted over with trees and shrubs to create forests, parks and picnic areas, or transformed into Israeli artists’ colonies. Some argue that Israel set out to erase any vestige of Palestinian roots in the new country. Now, 63 years on, the ruins of Lifta are finally facing the threat of bulldozers and concrete mixers. spring in the ruins of Lifta. A long-term proposal to sell the state-owned land for the construction of luxury housing units and a boutique hotel on the site is awaiting the authorities’ final approval. It has caused a furore. Opponents of the plan include those who believe Lifta should be preserved as a monument to history; those who want to retain its charming environs as a rambling spot; and those – Odeh among them – who insist that one day they will return and reclaim their homes. For many Palestinians, Lifta is a symbol of the Nakba, literally the “catastrophe”, of 1948 in which 700,000 people were dispossessed. It embodies their longing for their land, and their bitterness at their continued refugee status. It is, wrote Palestinian author Ghada Karmi in a letter to the Los Angeles Times, “a physical memory of injustice and survival”. The development plan was approved by the Jerusalem municipality five years ago, but earlier this year the Israel Lands Administration – the state agency that took ownership of Lifta’s land under the Israeli law governing property deemed to be abandoned – began marketing the plot to private developers. A legal challenge stayed the tender process, but a decision is due any day on whether to proceed. The proposal is for 212 luxury housing units, expected to be advertised to wealthy expatriate Jews, a chic hotel and shops, and a museum. It suggests that some of the ruins be restored. But Lifta as a sanctuary and de facto heritage site will be lost. 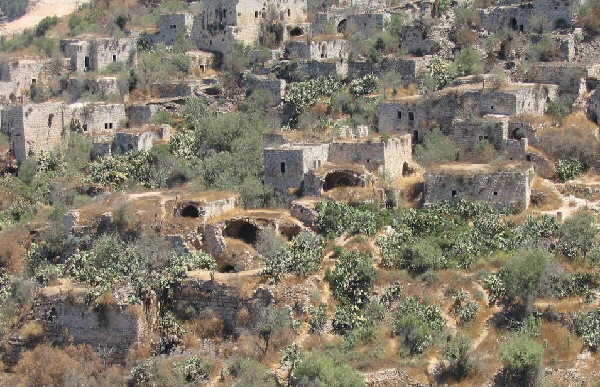 The remains of the village are bounded by roads, along which traffic rumbles to and from Tel Aviv and Jerusalem’s suburbs and settlements. On the ridge above Lifta, concrete mixers and diggers are at work on a high-speed rail link to Tel Aviv; deep in the valley below is a guarded complex, said to be the site of the Israeli government’s underground nuclear bunker. 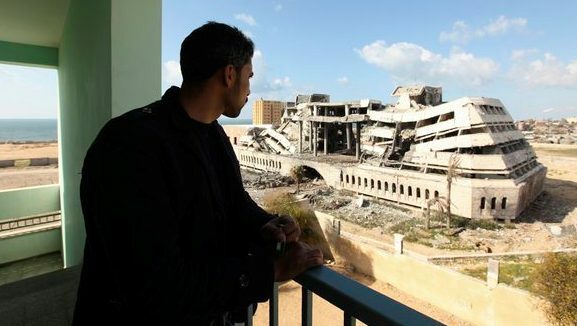 Out of sight of Lifta’s ruins, but built on its former farmlands are the Knesset (Israel’s parliament), the supreme court, the Hadassah hospital, the Hebrew University and the city’s central bus station. As we walk amid the ruins, Odeh points out the old landmarks. “Here was the mosque. This was the sheriff’s house. Here was the olive press. There is the house where I was born, and where my father was born. Over there is the cemetery. This was the sahn [courtyard] where people shared happy occasions and sorrowful occasions. Here I breathed my first breath. The first water I drank, I drank here.” It is painful, he says. But in 1948, when Odeh was eight years old, the bucolic life of Lifta came to an end. At the gateway to Jerusalem, Lifta was strategically important to the advancing Jewish troops. A series of violent skirmishes caused fear and panic, he recalls. There was firing and attacks from both sides. And then came the day his family left. Odeh’s father, then 33, carried the youngest of the eight children, and the family crossed the valley and climbed up to the main road to Jerusalem. His mother took the key to the house but they left everything they owned. “We had nothing but the clothes we were wearing. We had everything – and in one moment we had nothing. We became beggars.” As the villagers left, Jewish soldiers blew holes in the roofs of the houses to make them uninhabitable. Odeh’s father stayed in Lifta for a few more days. After boarding a truck heading away from the village, the rest of the family slept under fig trees. They spent the following two years in Ramallah before moving to Jerusalem’s Old City. His father, a broken man, developed stomach problems and died at the age of 35. His mother suffered from asthma from the time she left Lifta until her death. Many of the 3,000 residents of Lifta scattered across the West Bank and beyond to Jordan, but a core still live in East Jerusalem within a few kilometres of their former homes. Odeh himself later joined the armed resistance against Israel and spent 17 years in prison. NAZARETH, (PIC)– Israeli Prime Minister Benjamin Netanyahu emphasized his country’s commitment to develop Jerusalem employing several Judaization projects. The announcement comes a few days after Netanyahu gave a speech that drew heavy support by US Congress where he declared Jerusalem the eternal capital for the “Jewish state”. He said during a cabinet meeting held Sunday that the unity of Jerusalem is one of the foundations of the unity of the Israelis, and that the support that the projects have received by Knesset and Congress is an asset to Israel. The Citadel in the Jerusalem’s Old City where the meeting was held contained a mosque, as the tower was re-built by the Mamluks then the Ottomans who established mosque inside it. 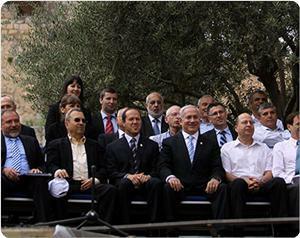 In the same session, Netanyahu announced a 100 million USD investment package. The statements come just a day after the High Arab Follow-up Committee for the Arab peace initiative (an Arab league committee) adopted a resolution that supports the Palestinian Authority going to the UN get recognition for an independent state of Palestine. According to the resolution, Palestinian borders would be based on those etched in 1967, and the capital would be East Jerusalem. OCCUPIED JERUSALEM, (PIC)– The Islamic Christian Commission in support of Jerusalem and the holy sites said that the Citadel of David mosque was not the first one that Israel converted into a Jewish site. The statement comes as Israelis celebrate the opening of a museum built on the ruins of the mosque. ”Israel has been taking control of the mosques and converting their usage to be consistent with Israeli objectives and plans to Judaize Jerusalem and erase its identity and religious symbols,” declared ICC secretary-general Hassan Khater. Situated in the Al-Khalil gate, the museum serves as a dangerous center in finishing the Judaization of Jerusalem, Khater stated. During the opening ceremony, Israeli officials earmarked $100 million to support Judaization projects in Jerusalem, projects related to culture and history. According to Khatir, the sum does not represent what is actually spent on the city by the Israeli development fund and the Jerusalem municipality as well as private religious funds. He estimated that the total amount of what is spent to rise above one billion dollars a year. The museum opening comes after Israeli Prime Minister confirmed during a speech to US Congress that Israel would not compromise on Jerusalem in negotiations with the Palestinians. The key lesson is Israel has far too much power over American politicians. Political whores in both parties sell-out American military personnel and America herself to please their string-pulling Israeli overlords to selfishly promote their own political careers. If they refuse, the Israel lobby will do all they can to see to it that they will lose in the next election. This is why Congress and the White House are unAmerican and kosher. This is why American sailors, airmen, soldiers and Marines are being sent off to wars for the benefit if the Jewish state of Israel. This is why one Jewish “U.S.” Senator, Chuck Schumer, actually believes and openly said that he’s on a mission from God to be Israel’s protector in the U.S. Senate! Not one “journalist” questioned him about his priority of Israel, not America, first. To help seal the fear of Israel they use the Bible. The Bible teaches all sorts of Jewish superiority. One fear based Bible threat is found at Isaiah 60:12 which plainly teaches that God said, “For the nation and kingdom that will not serve thee shall perish; yea, those nations shall be utterly wasted.” Another is found at Genesis 12:3 which has God saying to Abram, aka Abraham, which is taken to apply to Israel, too, “And I will bless them that bless thee, and curse him that curseth thee: and in thee shall all families of the earth be blessed.” This is nothing but psychological warfare plain and simple. And U.S. politicians appear to fall for it! U.S. Representative Michelle Bachmann recently said to the Republican Jewish Coalition, “I am convinced in my heart and in my mind that if the United States fails to stand with Israel, that is the end of the United States. . . [We] have to show that we are inextricably entwined, that as a nation we have been blessed because of our relationship with Israel, and if we reject Israel, then there is a curse that comes into play. And my husband and I are both Christians, and we believe very strongly the verse from Genesis, we believe very strongly that nations also receive blessings as they bless Israel. It is a strong an beautiful principle.” Do we really need politicians who believe in curses and hexes??? The Main Battle Dressing Station on the USS Liberty was described as a “bloody scene reminiscent of the American Civil War.” The Israeli torpedo and machine guns took a terrible toll on the Liberty’s crew, killing 34 and wounding 172. OCCUPIED JERUSALEM, (PIC)– The Israeli occupation government has revealed a plan to further Judaize occupied Jerusalem and change demographic realities under the pretext of propping up the economy of the city. The Prime Minister’s office has announced recently the government’s intention to approve the spending of over 80 million dollars to carry out what it called “a comprehensive economic plan” over the next five years. The plan, which is considered by Palestinian parties a noticeable escalation of the Judaization of the holy city, is to implement a number of projects that will change the face of the city and to encourage new segments of Israeli society to settle in it. According to the announced plan 42 million US million dollars will be spent on developing the infrastructure and developing the Western Wall (the Buraq Wall as it is called by the Palestinians) to encourage tourism. The Zionist Ministry of Tourism will also spend 21.5 million US dollars to encourage the building of hotels to increase the number of hotel rooms available to tourists in the city. The plan also includes 20.5 million dollars for establishing research and science institutes which requires establishing new buildings. Another 20.26 million will go to building student accommodation and an academic city which aims to attract economically productive people to live in the city. The statement from Netanyahu’s office also said that the government might add Jerusalem to the areas which get government support where university students who finished their military service will be legible for government grants. OCCUPIED JERUSALEM, (PIC)– Mahmoud Aramin, a Palestinian resident of Jerusalem, was forced to demolish his home on Saturday to avoid his house being demolished by the municipality and get charged extortionist rates for the demolition. The Zionist occupation municipality ordered the demolition of Aramin’s house on the pretext of lack of planning permission despite the fact that the municipality had already ordered Aramin to pay a high financial penalty for not having a planning permission which he was paying by monthly instalments. Aramin’s neighbours and human rights activists who witnessed the demolition spoke of the physiological scars resulting from demolition of Palestinian homes in Jerusalem under various pretexts, especially when home owners are given an ultimatum to demolish their own homes themselves or the municipality will carry out the demolition and charge the owner for the demolition. Many Palestinians in Jerusalem are forced to build new homes or make extensions without a planning permission because the Israeli occupation policy in Jerusalem makes it virtually impossible for Palestinians to get planning permissions.